In Germany, the Easter Season (following Fasching) is the second most important holiday season of the year. You’ll find decorations outside just like you do at Christmastime and the season is celebrated with just as much gusto… outdoor trees are decorated with plastic eggs and signs of spring all over. In Europe, especially in Germany, you will notice that people decorate their doors and house entries for each season of the year. Their decorations can range from simple to elaborate. However, differing from the US, people can leave things outside without much fear of vandalism or stealing – except on Hexennacht! I love the signs of spring that start showing up a couple of weeks before Easter. One of these signs is the Ostermarkt – the Easter Market. 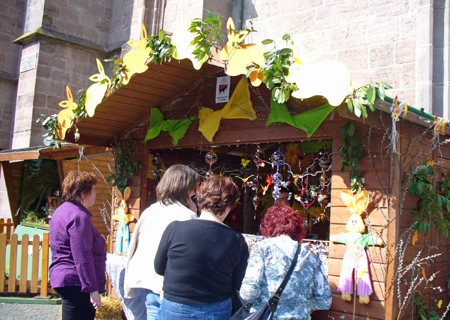 At this time, the same wooden stands that are in the village square for the Christmas markets make their appearance again in the village and city squares – only this time they are decorated for spring and filled with tons of Easter goodies. Oster Markets are found in most areas of Germany. 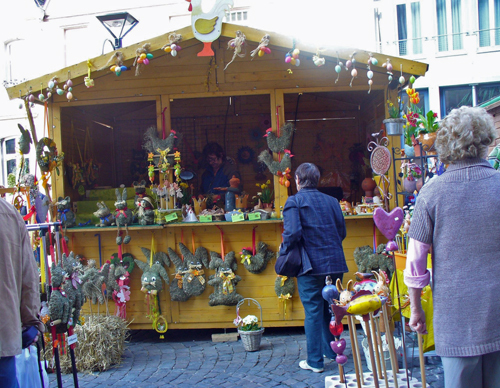 One of my favorite markets for Easter or Christmas is in St. Wendel, Germany. St. Wendel is a mid-sized town in the Saarland (a region of Germany that has bounced governing bodies between Germany and France all throughout history, but presently is German). There is an important monastery in this town, the Missionhaus, and it is named after Sankt Wendel of Trier (another very old Roman city in Germany). There is also a nice Dom (cathedral) – St. Wendel has an active central city marketplace, and the markets tend to branch out from the square and snake up and down the winding city streets. I don’t think there is any season of the year where you won’t find something fun and interesting happening in Germany, so just come on over and explore! 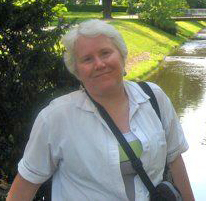 Guest Contributor, Cheryl Patterson, is a teacher for the Department of Defense School System in Germany. During the week she works with Army kids on an American Army Post, and on the weekends she and her husband take advantage of living in Europe, by traveling all over the continent. The Pattersons are avid participants in the walking sport of volksmarching, and incorporate the sport into their world travels.